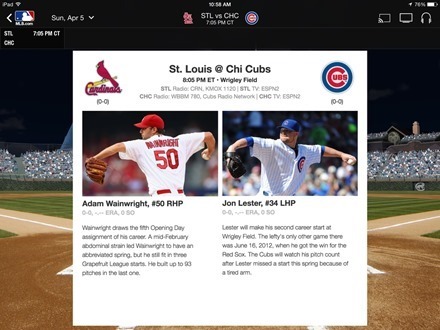 MLB At Bat, the official Major League Baseball app for iPad and iOS, has been updated right on time for Opening Day of the 2015 season. The app was updated to Version 8.1.1 yesterday and is looking great and all set with previews of tonight’s opening matchup of the Cardinals vs the Cubs and all the rest of the slate for tomorrow’s games too. And here’s an App Store link for MLB At Bat; it’s a free app with subscription options starting at $2.99 per month, and a universal app designed for both iPad and iPhone.